In 2005, Margaret and Christine Wertheim of the Institute For Figuring began to crochet a coral reef in their Los Angeles living room. 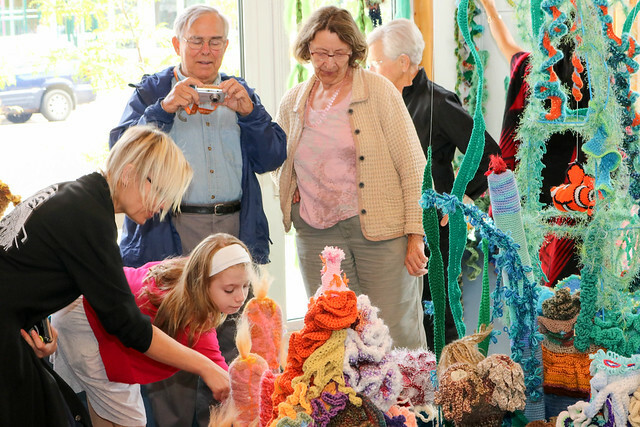 Today their Crochet Coral Reef is the largest participatory art and science project in the world. In 2007, the IFF began a Satellite Reef program as a way for local communities to participate in its Reef project. Satellites have been exhibited worldwide in the United Kingdom, Germany, Australia, South Africa, the United Arab Emirates, and Japan, as well as in many cities and towns in the United States. The Minneapolis Satellite Reef is one of the newest additions to this ever-evolving woolly archipelago. Organized by the Minneapolis Institute of Art, the Satellite was on view at the MWMO’s Stormwater Park and Learning Center from August 23 – November 21, 2015.